Tavern you will get set of quests to perform. By doing these quests, you can win various prizes. Idle Heroes Strategy Game Guide. Every 24 hours at Tavern you will get set of quests to perform. By doing these quests, you can win various prizes. The tavern will unlock for you at level 28. The number of daily quests available is limited. You can increase the limit by upgrading VIP level. You could use quest scrolls for more quests. Quests have varying degrees of difficulty marked with stars. The easiest is 1 star, the hardest is 7 stars. Each quest has a specific time to complete. You can spend gems to complete quests quickly, but this is completely pointless. 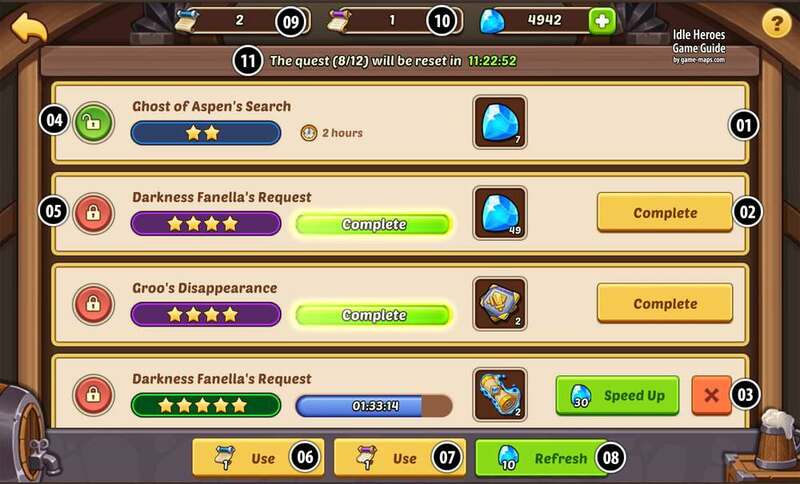 "try to refresh Quest to get 4 stars and above"
You should collect Quest for Tavern Event. There are two ways to save quests. "Close" it before you start it. But it will get one quest less next day - it is worse solution. Do not "Complete" it. Just do it and do not complete, wait till Event. It is better option, becouse this this will not reduce the number of available quests. 01 Open Quest to perform. It is not completed till you click "Complete". You can here close quest and prevent it to refresh. This scroll will add one 1 to 4 stars quest. 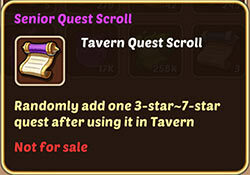 This scroll will add one 3 to 7 stars quest. "Refresh" will refresh all Open Quest with zero progress..